This memorial plaque to the renowned British journalist is affixed on Central Park’s eastern perimeter wall, not far from Engineer’s Gate. 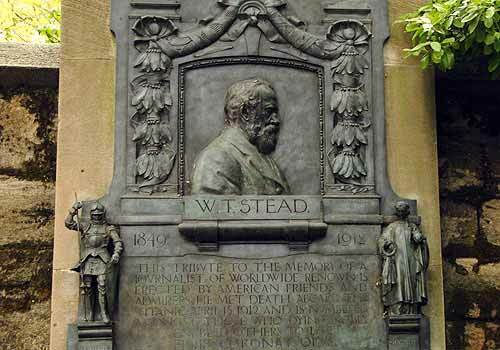 Stead was particularly known for his reportage on child welfare, social legislation and reformation of England’s criminal codes. He was one of more than 1,500 people to die aboard the passenger-liner, Titanic, when it struck an iceberg an sank on April 15, 1912. East Side Perimeter Wall at Fifth Avenue and 91st Street.